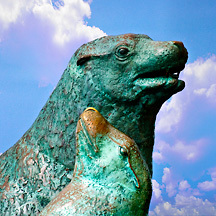 Commissioned to commemorate the 50th anniversary of Sea Lion Caves, and publicly dedicated in 1982, Sea Lion Family depicts just that - a life-size sea lion family, with an adult bull male, an adult female, and a young pup sea lion, sunning themselves on the rocks. The sculpture is large, and at 1,500 pounds, was likely the largest cast bronze sculpture in Oregon at the time - and certainly the largest thing Pacific Northwest nature artist and sculptor Ken Scott had done up to that time. On the day of the unveiling, the wind-blown fog was cold and damp, but the praise for Ken Scott's huge bronze sea lion sculpture and the people who founded and developed the Sea Lion Caves as warm and effusive at a celebration of the 50th anniversary of the caves. About 200 people were on hand to watch (then) Gov. Vic Atiyeh and his wife, Dolores, unveil the big sculpture. The new piece of art, received a rousing ovation from the crowd assembled on the cliff-side dedication site outside the Sea Lion Caves building. Visitors at the time marveled over the size of the animals, their natural appearance and the dignity and family affection portrayed in the sculpture - the cost of which was about $75,000 and took Scott nearly a year to create. It was cast by Maiden Bronze Inc. of Sandy.